Fansipan is branded “the Roof of Indochina” at the height of 3,143m; Fansipan is to be approved as one of the very few eco-tourist spots of Vietnam, with about 2,024 floral varieties and 327 faunal species. The climb is rough, wet and cold, but the views are rewarding if the weather is good. The top is accessible year-round to anyone who is in good shape and properly equipped. 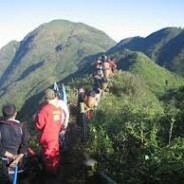 No ropes or technical climbing skills are needed, just endurance.Trekking time is 5 – 8 hours per day. 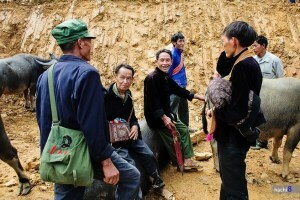 – Always stick to the group or local porters in case of assistance, don’t deviate. Trekking up to the top of the highest mount to hug that triangle metal piece saying “Fansipan 3,143m” has become a long time tradition among young trekker. 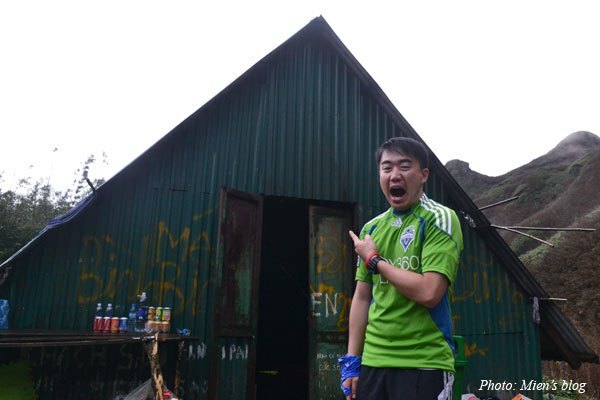 And obviously, Fansipan is also a kind of tourist attraction since it is very close to Sapa, a famous destination for tourists in the North of Vietnam, and a few adventurous and athletic travelers love to combine their Sapa trip with this Fansipan Mount trekking. Best time to do this whole trekking thing is April and May when the weather is good, not cold (and especially) not rainy, and you will also have a clear view of the beautiful valley with flowers in bloom. Actually the view from the camp will be very nice if it is not rainy or too foggy. And in fact in dry weather you can even do camp fire here. Inside the tin house at night. The hole on the door keeps the winds blowing in all night. 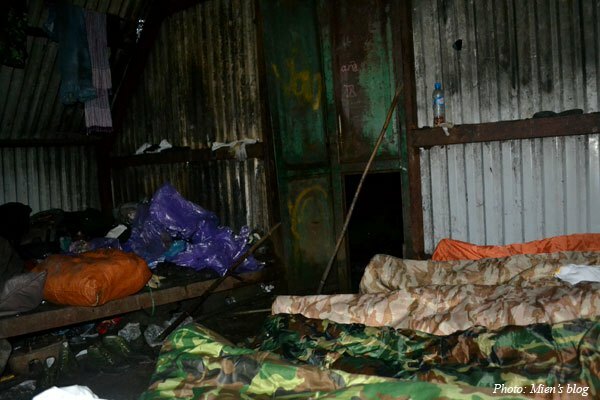 It is quite crowded in the camp at night. Candle-lit dinner. Of course there is no electricity at the height of 2,800m! 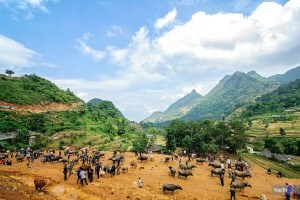 Thousands of domestic and international tourists gathered for the 2015 Khau Vai Love Market Culture-Tourism Week, which kicked off on May 13th in Meo Vac district of the northern mountainous province of Ha Giang. The week, which will run through May 16th, features a wide variety of activities including the northernmost beauty contest, cow fighting festivals, horse races, traditional dish exhibitions, and incense offerings at two temples in Khau Vai commune. 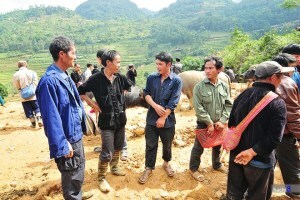 Vice Chairman of the district People’s Committee Tran Kim Ngoc, who is also head of the organising board, said the week aims to preserve and uphold the traditional ethnic minority culture in the province. The Khau Vai Love Market has its origins in a legend about a couple who were deeply in love but were forbidden to be together because they hailed from differed ethnic groups. 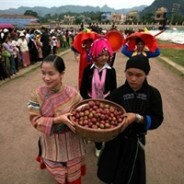 The two promised to meet once every year in Khau Vai on the 27th of the third lunar month. The “Phong Luu” market of Son Vi commune is also a highlight of the event, drawing crowds of local residents and neighbouring Chinese people to join and enjoy the event’s art performances and games, according to Ngoc. During the event, tourism service quality, social order and traffic safety have been ensured to serve tourists, he added. The century-old festival, which is held annually in the third lunar month, is a popular meeting place for ethnic groups in the locality, particularly those in love./. 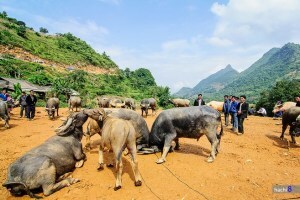 The bus journey is a four and a half hour trip from Hanoi to Sapa via the brand new Hanoi – Lao Cai highway giving you the unique opportunity to immerse yourself in the beautiful landscape of the mountainous area of Northwest Vietnam. The bus accommodates up to 29 passengers with its luxury service including air-conditioning, Wi-Fi, bus attendant, complimentary bottle of water, comfortable blanket and pillow and free tea, coffee and candy at the pickup point. Pick up/ Drop off in Hanoi at: 12 Ly Thai To Street, Hoan Kiem District, Hanoi. U Sapa has the reputation for serving some of the best food in Sapa and uses the freshest herbs, vegetables, and organic greens from the resort’s own gardens. The award-winning Dining on the Bellevue Restaurant is located at the tip of the headland and presents 270 degree views, whilst Dining offers regional and international cuisine. A large selection of wines from many of the world’s most respected regions is featured in The Cellar. 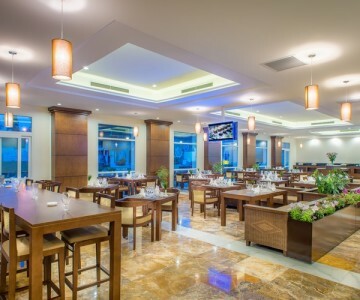 Ta Van Restaurant in Victoria Sapa Resort & Spa offers the finest dining available in the region. Our Chef’s fine cuisine blends local ingredients to create exciting international dishes with a French and Vietnamese flair. 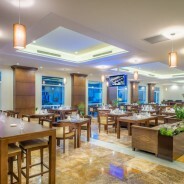 Our restaurant has a large central fireplace and a cozy atmosphere. 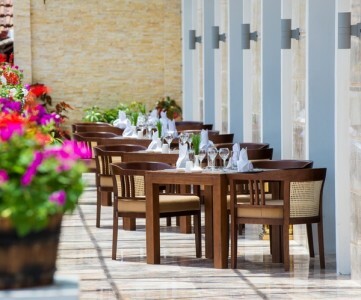 In the summer months, dine on the terrace and enjoy spectacular views over Mount Fansipan. 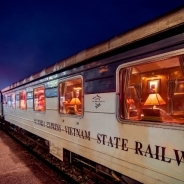 The most popular and convenient way to get to Sapa from Hanoi is by sleeper train. We try to make this very easy for our guests by arranging train tickets for more than 95% of our guests. Once you read these hints and tips you will understand why it is better to leave it to us the professionals to take the guess work out and leave you to have a smooth stress free journey to Sapa. The trains to Lao Cai depart Hanoi everynight of the week at 21:50. 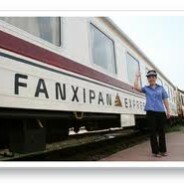 We choose to book our guests on the Livitrans or King Express or Fanxipang train carriages as we believe these to be the best. These carriages are VIP with 4 beds in each room. There is a toilet at the end of the carriage. We strongly advise our guests to book a private 4 berth cabin even if there are only one of two guests travelling, this ensures privacy, security and a better night sleep. The train line was build in 1906 and you can feel every piece of history in the track as you take the journey 320kms to Sapa. 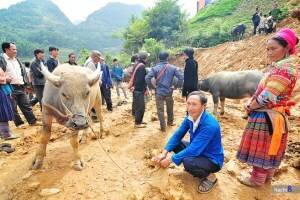 It certainly is a wonderful way to travel and makes coming to Sapa all that more exciting. By making a train booking with Sapa Travel, you acknowledge reading and accepting these Terms and Conditions and agree not to violate our policies. In these Terms and Conditions “we, our, us, company” refers to Sapa Travel, an online operator for train ticket booking in Vietnam. “You” refers to the individual person creating an account with us and/or making a reservation through us. This website is offered to you and is conditioned on your acceptance without modification of the terms, conditions and notices contained herein as they exist at the time the booking is made. Your use of this website including the use of your booking, and the site information, constitutes your agreement to the following terms, conditions, and notices. Sapa Travel reserves the right to change any part of this agreement without notice and your use of the Website will be deemed as acceptance of this agreement. We advise users to regularly check the Terms and Conditions of this agreement. Sapa Travel is a third party booking agent, which allow customers to reserve train ticket online in advance. We are therefore not to be held accountable for train services provided by Vietnam Railways and private train companies such as Livitrans, King Express, Sapaly to name a few. Please direct any inquiries, concerns or complaints to the train travel experience to the corresponding people in charge. – For the ticket delivery process, when we send you the booking confirmation and request for an address where the tickets be delivered you will have to provide us the address to deliver your tickets prior to your departure time. Otherwise, we are not responsible for delay or missing your train. – Credit Card: We accept payment through all major credit cards. In both ways, we will only proceed with the payment after reconfirming with you. – Ticket cancellation or amendment made after issued Booking Confirmation will be charged 30% of the ticket price. – Ticket cancellation or amendment made 48 hours before departure date will be charged 50% of the ticket price. – No Show or Ticket cancellation or amendment made less than 48 hours of the departure date will be charged 100% of the ticket price. Sapa Travel reserves the right to cancel your booking with a prior notice. In such case, a full refund of 100% will be credited to your account. 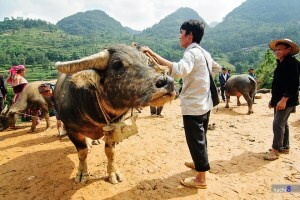 Sapa is famous for both its fine, rugged scenery and also its rich cultural diversity. If trekking is your thing, why not opt for a two or three day experience incorporating homestays in the villages of your choice. What better way to expose yourself to the cultures and colour of Vietnam’s ethnic minorities on a trek through terraced rice paddies, bamboo groves and traditional villages all in the shadow of Mount Fansipan. 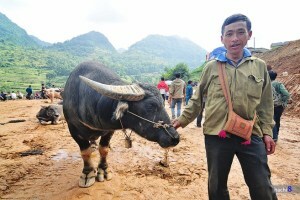 Sapa Travel work in association with a number of host families throughout the Hoang Lien Son Mountain range and each village has something different to offer. 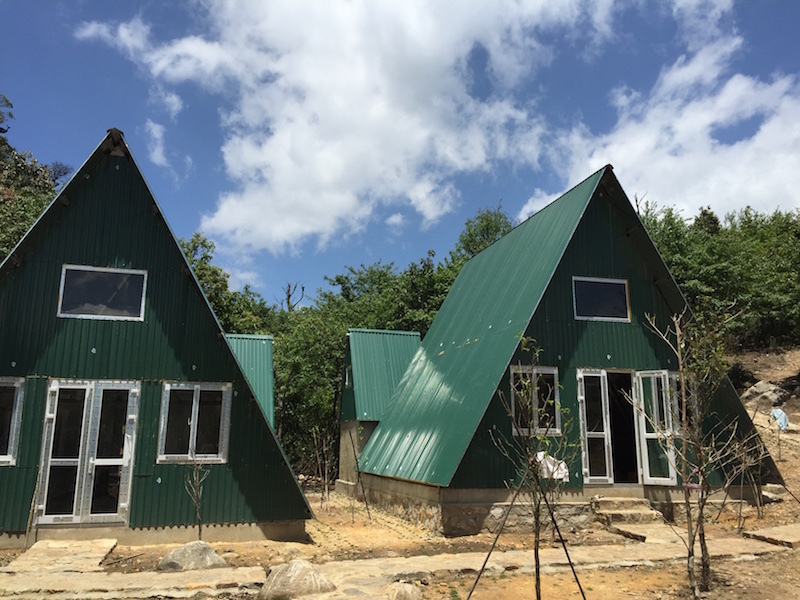 Our homestay partnerships grew out of Sapa Travel’s mission to promote and support responsible travel. From the popular Lao Chai and Ta Van homestays to the quiet and remote village of Lao Chai San, each homestay has a different feel, but all offer the traveller a rare glimpse into the way of life that has all but vanished from the rest of Asia. Here you will find no welcome mats or rehearsed “cultural” parades, just real people living real lives who greet visitors with genuine warmth and real smiles. If you are looking for absolute authenticity in a real home, then this is the choice for you. 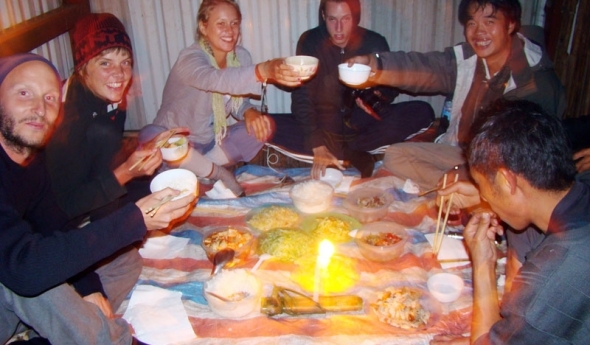 You can cook and eat with your host family and generally enjoy the hospitality of Sapa’s mountain people. The only way to guarantee a private experience is to stay in a traditional home. 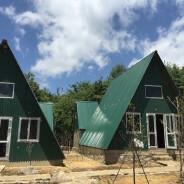 These homes also come equipped with a sleeping area and mosquito net, but bathroom and toilet facilities vary. Many homes have no toilets whatsoever, whilst others have long drop latrines. Most of the buffalo here are male, huge and strong with quite threatening looks. It is not unusual for some of the aggressive-looking animals to suddenly start a fight. The market attracts many tourists, foreign and Vietnamese. Many people come to the market to sell and buy cattle, while some are just watchers. Some onlookers gather for chit-chats. 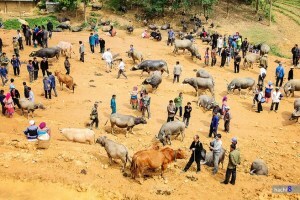 Although buffalo are often considered an important asset of farmers, they do not have fixed prices. Instead, both sellers and buyers decide on the animals’ value and then negotiate with each other. 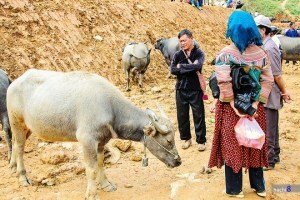 This buffalo for instance is offered at VND40 million (US$1,800). 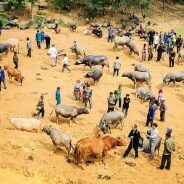 Among the buffalo put for sale, many are sold specifically for breeding, while others for farming or meat. 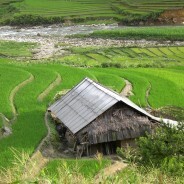 Sapa Travel is a team of experienced guides in Sapa Town and its villages. 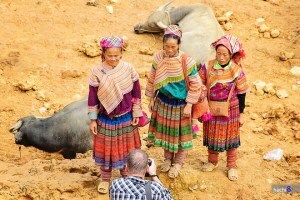 Sapa Travel is not a big company, and we do not pretend to be. Our work is to combine a personal touch with a high level of reliability, while maintaining excellent value for our inbound destination management services to Sapa and the North of Vietnam. We compete with a flexible and creative attitude towards travel, and by doing what we say when we say we will do it. While many large companies promise to have their ‘best’ team on the ground, we ARE the team on the ground, providing you unparalleled communication and attention you deserve. On 21st January 2015 we have the announcement from Vietnam Trails Cooperation 10/CĐ VTHN that the SP 7 and SP 8 train will stop their services from Hanoi to Lao Cai and return. So, the previous train timetable will be only on the SP 3 and SP3 trains. So, if any of the passengers who have the vouchers for SP3 and SP4 will get the new departure and arrival as this notice. The services and seating will keep unchanged.